Chronic fatigue syndrome (CFS) is a very disabling condition. It causes you to feel a specific type of tiredness. It’s not the kind you have after a long day of physical activity where you cannot wait to lie down in your bed and get some rest. No, this is different from that. This is the kind of tiredness that makes you feel as if weights are tied to your arms and legs. It doesn’t matter how much sleep or rest you get, you can never get over this feeling of exhaustion. Chronic fatigue syndrome impacts every area of a person’s life and robs them of some of the most important events of their life. Imagine feeling like you have the exhaustion that accompanies the flu on your daughter’s wedding day? Or imagine being passed over for that big promotion at work because you were too exhausted to get dressed that day? Chronic fatigue is disabling and extremely frustrating for its sufferers. Another area of frustration is the fact that no one really understands what chronic fatigue is all about. It is unknown exactly what causes it or why it affects one person and not another. But one theory that seems to be gaining popularity is that it may be connected to a misalignment in the bones of the upper cervical spine brought about by an accident or injury to the head and neck. This can include a car accident that resulted in whiplash, a sporting accident, a bad trip and fall, playing high-impact sports, or any other type of trauma causing the neck muscles to overextend or the head to whip back and forth violently. We’ll explore this more in-depth later on. 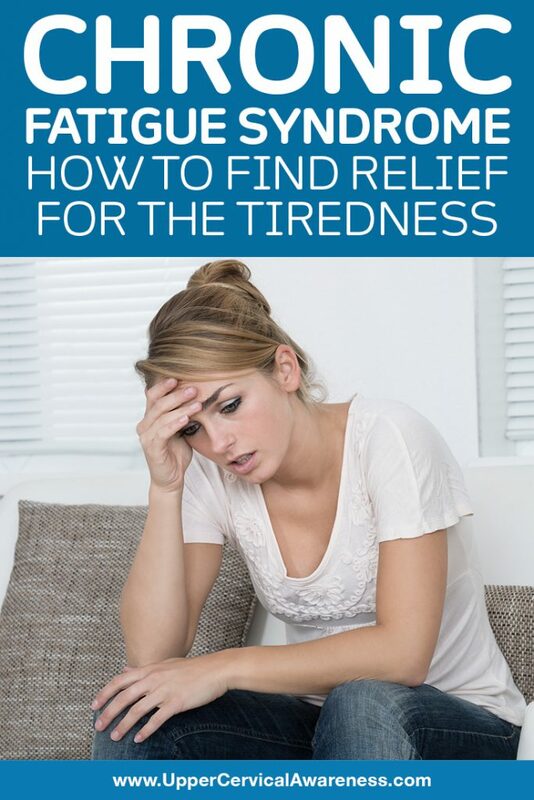 First let’s see 7 signs indicating you may have chronic fatigue syndrome. Extreme fatigue after exercise. Of course, it is normal to feel somewhat tired after exercising, but if this feeling lasts longer than expected, you may have CFS. If your fatigue and exhaustion last for more than 24 hours after physical exercise, you should let your doctor know. The body should be able to repair and regenerate itself when you finish exercising. Sleeping at night is when this takes place most prominently. However, waking up feeling unrefreshed and just as tired as you did right after your workout can be a sign of CFS. Inability to focus and remember things. Significant loss of short-term memory and concentration issues are not normal and should make you question what is happening in your body. Energy is needed to help the brain concentrate and make memories. However, those with CFS often do not have the energy needed for this function of the body. This can result in these kinds of cognitive issues suggesting CFS is to blame. Muscle and joint pain. Sure, all of us suffer from a little muscle and joint pain now and then. But, if you have it more than normal and are not sure why it is occurring, take note. If you wake up quite often with aches and pains with no known cause, you may have CFS. Getting sick too often. Are you constantly feeling sick and run down? Do you have a sore throat, cold or flu-like symptoms, or other signs of illnesses quite frequently? CFS may be to blame. However, it is a good idea to visit your doctor as these things can happen for other reasons as well. Digestive problems. Constipation, cramping, and other digestive issues can be a symptom of CFS. Irritable bowel syndrome is another indicator of CFS, but not the only indicator. It must be in combination with some of the other listed symptoms to be a cause for concern. Fluctuations in body temperature. Feeling hot one minute and cold the next can indicate CFS. Abnormal body temperature is sometimes seen in those with chronic fatigue syndrome. You may have chills all day long but have hot flashes while in bed at night. This can also indicate other health problems, so it is a good idea to inform your doctor about it. Abnormal headaches. If you are having more severe or additional headaches to those you may normally experience, chronic fatigue may be at the root. This can be caused by impaired neural pathways and go along with weakened memory and focus issues. Migraines and headaches are common when your brain is not functioning at its best. One thing that may be hindering your brain and body from communicating properly is a misalignment of the bones of the upper cervical spine. The C1 and C2 vertebrae are what houses the brainstem and act as its protector. However, these bones are very moveable, allowing the head to move in many directions. This makes them more susceptible to misaligning through just a simple blow to the head or neck, a trip and fall, whiplash, or other minor trauma. If the brainstem is stressed, it could be sending improper signals to the brain about what is happening in the body and could be the underlying cause of chronic fatigue syndrome. Upper cervical chiropractors have been specifically trained to find the tiny misalignments in the neck and then work with our patients to correct them. We use a method that is both gentle and precise. It allows us to help the bones move back into place without the need for popping or cracking the back or neck. Chronic fatigue sufferers have seen a big improvement in symptoms after receiving upper cervical chiropractic care.